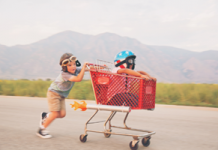 This article shows you how to adopt the Agile Results system. 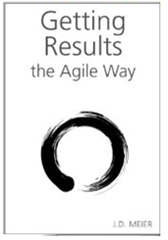 Agile Results is a simple results system. You can adopt the basics of Agile Results in under five minutes. You can adopt or tailor pieces as you see fit. By adopting The Rule of 3; the Monday Vision, Daily Outcomes, Friday Reflection pattern; and the life Hot Spots, you establish a rhythm of results and achieve work life balance. Agile Results is action-oriented with an emphasis on outcomes over activities, while supporting continuous growth and learning. Agile Results also helps you manage your energy across your work and life, giving you the power to achieve whatever you want with sustainable results. Learn how to adopt The Rule of 3 to focus and prioritize your action. Learn how to adopt the Monday Vision, Daily Outcomes, Friday Reflection pattern to establish a rhythm of results. Learn how to adopt life Hot Spots to achieve work-life balance and spend your time and energy on the most important things in your life. Agile Results is a simple and effective results system for personal productivity. It works by establishing a rhythm of results, prioritizing value, and taking simple, consistent actions towards your results. By treating time as a first-class citizen, you can set effective boundaries and achieve work-life balance. By having a system you can count on, it helps you get back on your feet again. The simplicity is part of its effectiveness. The Rule of 3 is about identifying three outcomes each day. By starting your day with three outcomes, you clarify what you want to accomplish. When you know what you want to accomplish, you can prioritize more effectively, and you can let things go. Rather than focus on your endless backlog or overload, you shift your focus to the three most valuable things you can do today. Each day is a fresh start; so is each week, each month, and each year. It’s your chance to wipe the slate clean and cherry-pick your most important items. The most important thing about The Rule of 3 is that you are focusing on outcomes over activities. You are also limiting what’s on your focus so that you don’t overwhelm yourself. When you finish your three outcomes, you can always grab more. This is about setting your sights on three meaningful results for you, and using that to drive your day. It can be as simple as (1) have a great lunch experience with a friend; (2) complete 10 draft pages for your next book; and (3) complete an outline of your project plan. The Monday Vision, Daily Outcomes, Friday Reflection pattern is a simple weekly results system. On Mondays, you identify the three most important results for the week. Each day, you identify the three most important outcomes for the day. On Fridays, you reflect by asking yourself what are three things going well and what are three things to improve? Life Hot Spots is a heat map for your life and a way to invest your time and energy in areas that matter: mind, body, emotions, career, financial, relationships, and fun. When you invest in these areas, the sum is more than the parts. By spending time in fun, you keep your mind and emotions in good shape. By investing in your mind, body, and relationships, you perform better at work. The most important concept for the life Hot Spots is to set boundaries in terms of time or energy. The simplest way to adopt Agile Results is to start using The Rule of 3 to start your day. The Rule of 3 is about identifying three outcomes each day. Each day is a fresh start, and three is an effective limit. The Rule of 3 has been used with success in a variety of contexts. It’s sticky, and people tend to be good at remembering things in threes. While it’s recommended that you write them down, it’s more important that you internalize them, so you don’t have to look them up. A simple check is if you can say your three outcomes for the day, whether you’re in the hall or in your car or wherever you are. You can use The Rule of 3 to help you see the forest from the trees. By identifying your top three results you want for the day, the week, the month, and the year, you keep better perspective. Only write down three! Also, remember the life Hot Spots: mind, body, emotions, career, financial, relationships, and fun. Don’t overwhelm yourself. The Rule of 3 is about identifying only and no more than three outcomes each day. They are your tests for success. You can prioritize any incoming actions against your desired results. When you get distracted throughout the day, you can remind yourself what you wanted to accomplish. If you already have tasks lists, you can simply add your three outcomes to the top. This reminds you what you’re driving for. You learn your focus and capacity. 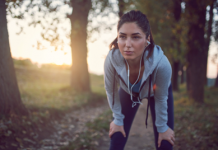 If you aren’t completing the three results you set for the day, you might be picking the wrong things, or you might be biting off more than you can chew. If you’re not sure where to start, pick one thing for yourself, one thing for your family, and one thing for your job each day. Can you say your three outcomes for today out loud? Are your three outcomes the three most important things you really want to accomplish today? Are your three outcomes actually results or achievements (not activities or tasks)? This is your pattern for weekly results. The idea is that each week is a fresh start. To adopt the Monday Vision, Daily Outcomes, Friday Reflection pattern, at the start of the week, identify your three most important outcomes for the week. In other words, if you look ahead to Friday, what three results would you like to have achieved? At the start of each day, identify your three most important results. You can then feed your results into the next week. For example, if you find that you are accomplishing your three results for the week, are they the right things? Can you push back on what’s on your plate? If, instead, you find that you aren’t finishing your three results each day, is it because you are getting distracted? Are you not picking the right three things to begin with? This is your continuous improvement loop. The more effective feedback you provide yourself, the more you can improve your results. Each week is a new chance to tune your results and learn more about your capacity and bottlenecks. Identify 3 compelling outcomes or results for the week. Identify 3 compelling outcomes each day. Identify 3 things going well and 3 things to improve. Stick with three outcomes for the week. Don’t create a laundry list of results. Identify the three most meaningful outcomes. You can always bite off more, after you complete your three results. Identify your three outcomes for the day, at the very start of your day, before you are overwhelmed or in the thick of things. This is how you drive your day versus react to it. When you identify three things going well, try to find the success pattern so that you are conscious of why and how. When you identify three things to improve, try to find the specific patterns that aren’t working so that you can identify specific actions to change, whether it’s thinking, feeling or doing. Do you know your three most important outcomes for the week? 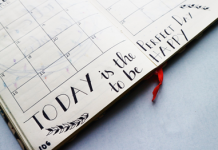 Do you know your three most important outcomes each day? Do you know your three key things going well? Do you know your three key things to improve? By investing in these areas, you set yourself up for success, and you help limit the impact of potential downturns. This also gives you a concrete way to achieve work-life balance, in the worst of times and in the best of times. To adopt the life Hot Spots, simply use the categories as a lens to identify your pain or opportunities, what actions or outcomes you want to focus on, and set more effective boundaries. You should set minimums and maximums for your Hot Spots in terms of time and energy. This keeps you from getting over-invested. Use your Hot Spots to set boundaries. Set a maximum on career and a minimum on relationships, body, and fun. In the right categories, setting a minimum helps you to avoid getting unbalanced and to improve other categories, while setting a maximum encourages you to learn to be more effective. For example, if you only have eight hours to throw at your day, you’ll use them wisely. The worst mistake is to throw more time at problems. The key is to reduce time spent, while increasing value and improving your efficiency and effectiveness. In this case, step one is deciding to spend no more than 50 hours each week on your career Hot Spot. Now it forces you to bite off only what you can chew. This is how you start improving plate management and pushing back effectively. You can only spread your life force over so much. The categories help support each other. If not properly allocated, they can also work against each other. Set a maximum of time to spend on career. Set a minimum of time to spend on your relationships. Set a minimum of time to spend on fun. Set a minimum of time to spend on your body. Test your results. If the time limits you set aren’t working, adjust them and test again. Are you investing the right amount of time in the right places? Are you reducing your worst pain points? Are you leveraging your best opportunities? Does your investment of time and energy actually reflect what you want to accomplish?